Cadiz Inn Backpackers i Cadiz, Spanien: Reservér nu! 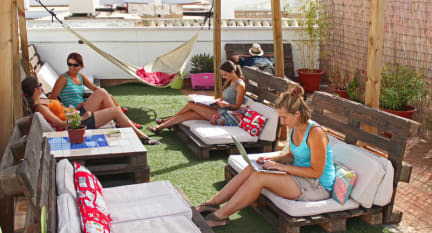 Our hostel has the best location in Cadiz at only 200 meters from the Atlantic ocean and 5 minutes from all interesting monuments of the old city. 2 minutes walk from train or bus station. Our staff is the absolute best, young travelers who want to share the experience of living in a city like Cadiz and show you the ins and outs of the silver cup as the city is known. Bright rooms are decorated in white, with brightly coloured finishes. Guests have access to shared bathrooms just outside the rooms. Please note reception hours are 7:00am til 23:00pm. We will give you a selfcheckin code to access the hostel trough WhatsApp.